Dear friends, Welcome to my blog. Using uniqueidentifier field as primary key and set the default value as (newsequentialid()) or (newid()) is a good choose for some scenerio. If you try to use SCOPE_IDENTITY() or @@IDENTITY to retireve the uniqueidentification ID after add new row, you will found that is not worked. As we know, the ASP.NET forum’s add post page contains a TabContainer control in one TabPanel there is a TinyMCE Editor for edit the post, another TabPanel is use for preview the post. When you move the mouse on the text, the related image and text which will be created on the code-behind show up in the tooltip after 1 second. during the loading process, a “loading” gif picture will display in the tooltip box. And we can also use WebService and AJAX to achieve the same goal. 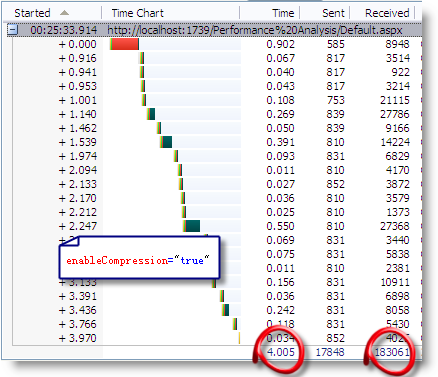 If we are using ASP.NET AJAX, the same effect can be achieve by AJAX Page Method easily. Based on my knowledge, the CalendarExtender’s language is based on the “Sys.CultureInfo.CurrentCulture.dateTimeFormat”, all of the primary function “_buildDays” “_buildMonths” “_performLayout” “_getFirstDayOfWeek” use the “Sys.CultureInfo.CurrentCulture.dateTimeFormat”. So, if we need change the language or culture of CalendarExtender, we need to change the “Sys.CultureInfo.CurrentCulture.dateTimeFormat”. Also, we need make sure the EnableScriptGlobalization=”true” to your ToolkitScriptManager or ScriptManager. 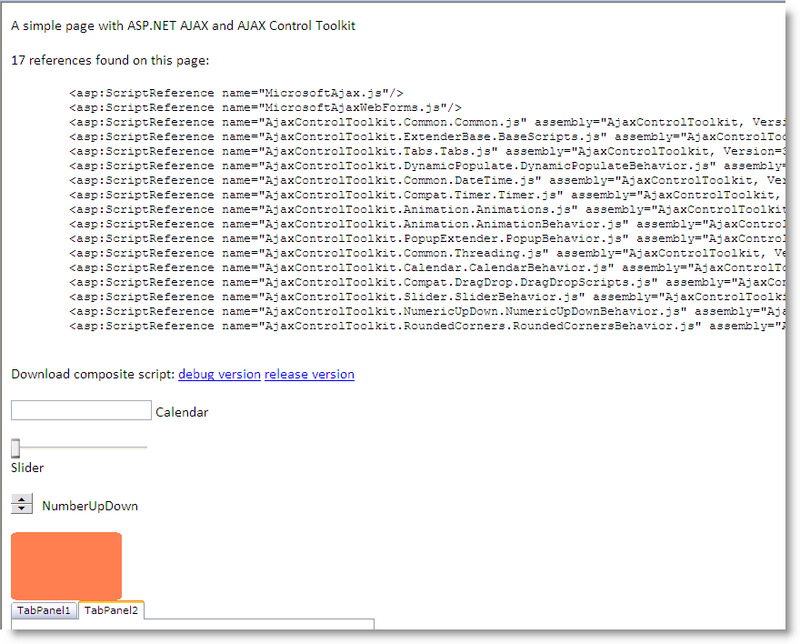 ASP.NET AJAX Control Toolkit FAQ: 6.2 How do I create a ModalPopup programmatically? However, if we need to create the content of tooltip dynamically by the Server-Side code, we can use the ICallbackEventHandler to achieve the faing goal. Please try the following demo, when you move the mouse on the text, the related image and text which will be created on the code-behind show up in the tooltip after 1 second. during the loading process, a “loading” gif picture will display in the tooltip box. I think everyone would agree that AJAX is one of the elements of “Web 2.0”, every web developers should know this technology. 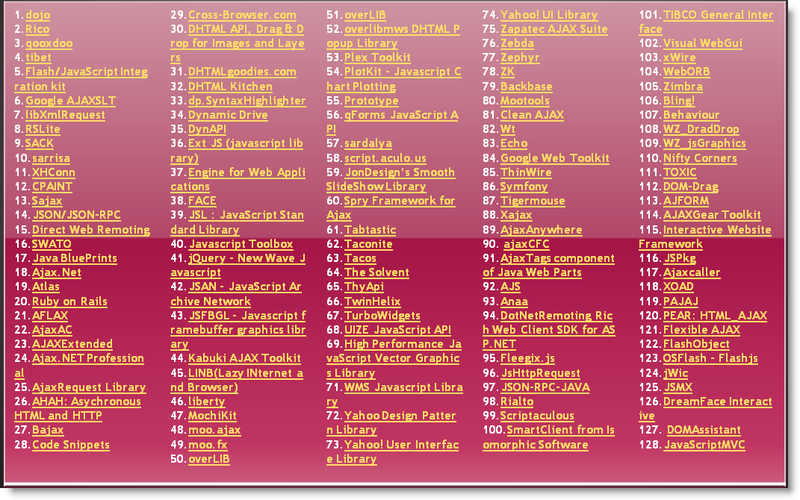 I have been collected a list of the popular AJAX Frameworks on my chinese tech blog, we will amazedly found that, there are more than 128 AJAX Frameworks! Refer to a voting result, among the 95% of the .NET developers that said they are using some flavor of Ajax either in production, development or prototype, the most used AJAX Framework is ASP.NET AJAX, with 73,7%, followed by the Ajax Control Toolkit which is used by almost half of the .NET developer that are using Ajax. However, many beginners always complain that, using ASP.NET AJAX make their web application slow down, don’t perform as well as they had hoped. Today, I would like to share some experience on how to optimize the ASP.NET AJAX application. So I created a simple page with a bunch of extenders on it: CalendarExtender, SliderExtender, NumericUpDownExtender, RoundedCornersExtender, and TabContainer for our experiments. 1. 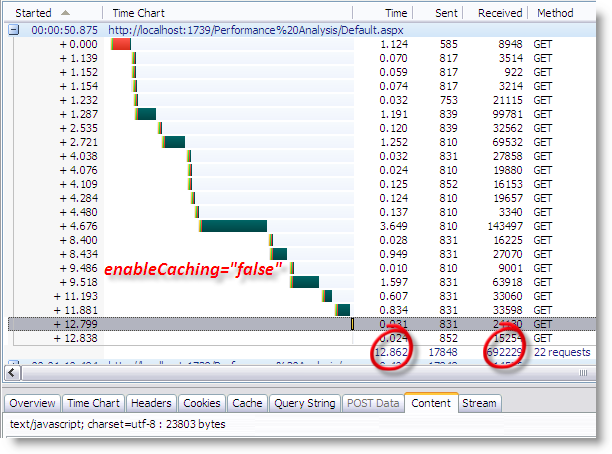 HttpWatch to show the network traffic. And we can see there are totally 22 requests and spend 9 seconds to get the 654k result. It is a really terrible in performance. 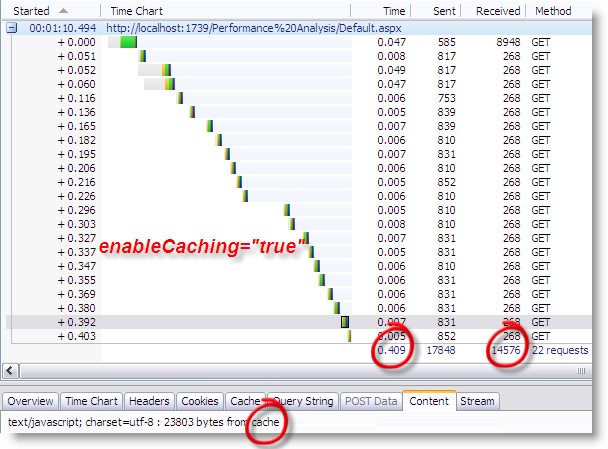 We know, in the development of web application, enable the caching is a must operation. To enable the caching of ASP.NET AJAX, we need make sure the enableCaching property of scriptResourceHandler is set to true. As our expected, the page response more quickly in the second time, the expend time is coming from 12.862 seconds down to 0.409seconds; and the received size from server decrease from 692K to 14K. As we can see in the screen shot, many script files are getting smaller. and the total size decrease form 692K to 183K, about 1/4 compare to before. ♣Note: The compression is not work in Internet Explorer 6.0, because there is an known bug in IE 6, that cause the mistake might be occur when receiving the Gzip header. 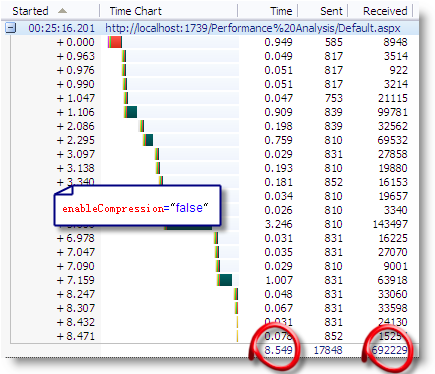 So the develop team close all the compression ability in IE 6. The ScriptManager control manages client script for AJAX-enabled ASP.NET Web pages. 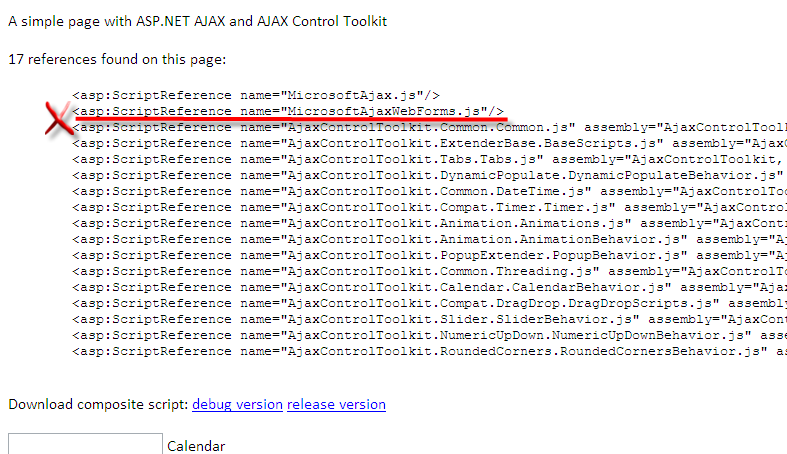 By default, the ScriptManager control registers the script for the Microsoft AJAX Library with the page. This enables client script to use the type system extensions and to support features such as partial-page rendering and Web-service calls. 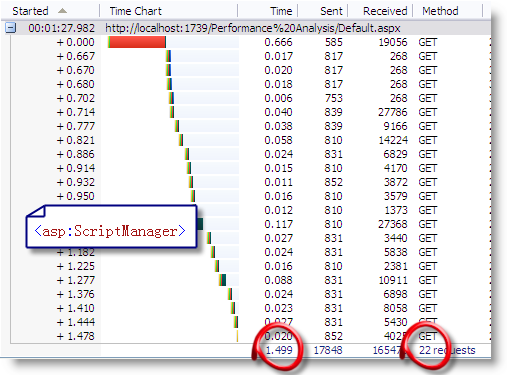 Following, we need to setting the property of ScriptManager to optimize the performance of ASP.NET AJAX. 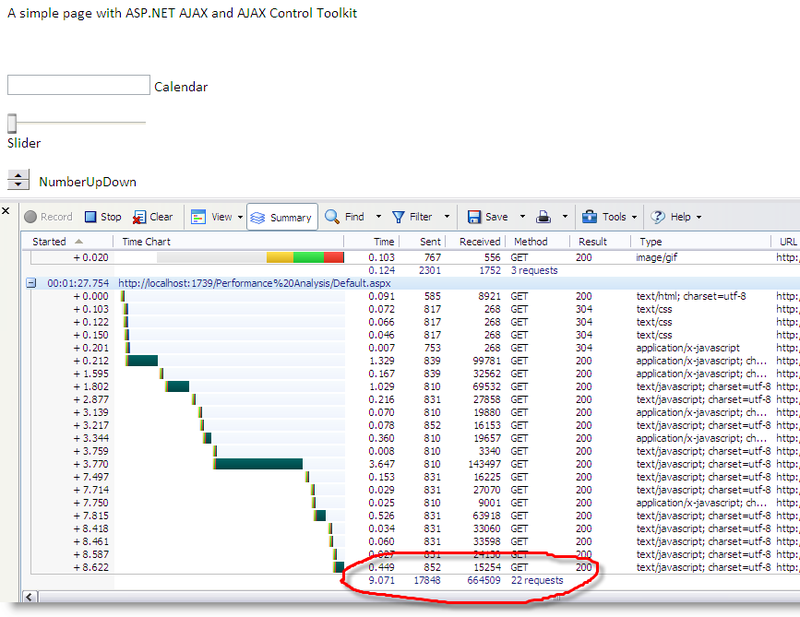 In one of Scott Guthrie’s post, he explain that we should avoid when deploying an ASP.NET application into production leave the <compilation debug=”true”/> switch on within the application’s web.config file. 2. EnablePartialRendering Yes or No? There is another property in ScriptManager named EnablePartialRendering, it gets or sets a value that enables partial rendering of a page, which in turn enables you to update regions of the page individually by using UpdatePanel controls. So, if we using the UpdatePanel in the page, we must set this property to true, conversely, if the UpdatePanel is not using in our page, it would be better that we set the EnablePartialRendering to false. That will cause the unnecessary file “MicrosoftAjaxWebForm.js”, which is used to the partial rendering not import to our page. ScriptManager control has LoadScriptsBeforeUI property which we can set to “False” in order to postpone several script downloads after the content is downloaded and shown. This adds the script references end of the <body> tag. As a result, we will see the content first and then the additional scripts, exteders, AJAX Control Toolkit scripts get downloaded and initialized. This will make the page show quikly, and provide a better User Experience. As the screen shot shows, It is a big savings in requests – we now get one request for Toolkit scripts instead of 12. In this scenario, we also got about a 50% download speed improvement by only having one request. 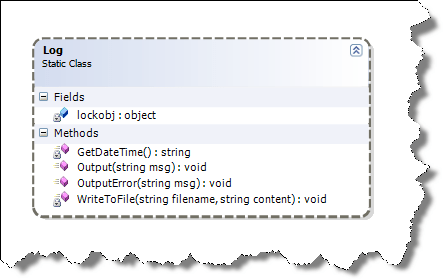 If you are using ASP.NET 3.5 with SP1, there is a more powerful tool to combining the Script file – CompositeScript. and then, we can add <CompositeScript> and <Scripts> elements as children of the ScriptManager control. Run the page and view the traffic. We will see just one script reference now instead of all the script inside the <Scripts> element. Rating control of AJAX Control Toolkit are already widely used, However, many of my friends recently complained that if they create Rating control in code-behind dynamically, then, the Rating status will be lost after a PostBack(not into ViewState). This article describes two ways to solve the problem. The problem is because we cannot create the Rating control in the Page_Load, just as we create other server-side controls (for example, TextBox, and so on) in code-behind. 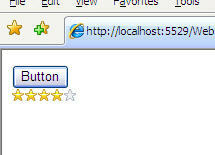 the Rating control must be created in Page_Init if we need ViewState to save its status across the PostBack. I was born in China 1986, and now working in Shanghai as a Software Engineer. I have been working as a Develop Support Engineer in Microsoft Global Technology Support Center after got the BE degree in Software Engineering. And also have been working in NCSoft China, and China Eastern Airlines as Develop Engineer. In free time, I activity in .NET Development communities such as ASP.NET forum and cnblogs (China). I am a Microsoft Certificate Professional for both Web Application development and WinForm Application development. And I have got the “General Develop Influencer” in 2009.